Please join the IILJ for a book launch of Hermann Heller’s Sovereignty: A Contribution to the Theory of Public and International Law , edited and introduced by David Dyzenhaus and translated by Belinda Cooper. 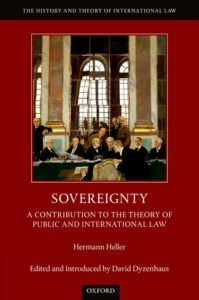 Sovereignty is the latest release in Oxford University Press’s History and Theory of International Law series. Participants include Belinda Cooper, Rob Howse, Jean Cohen, Jeffrey Barash, Hubertus Buchstein and Douglas Morris. Benjamin Straumann will moderate. Hermann Heller was a Jewish socialist and militant opponent of the Nazis. He is hardly known outside of Germany, in large part because he died in exile in Spain in 1933. He was then in the midst of composing a definitive statement of his views, a book on state theory, which was subsequently published in a form revised by his assistant. 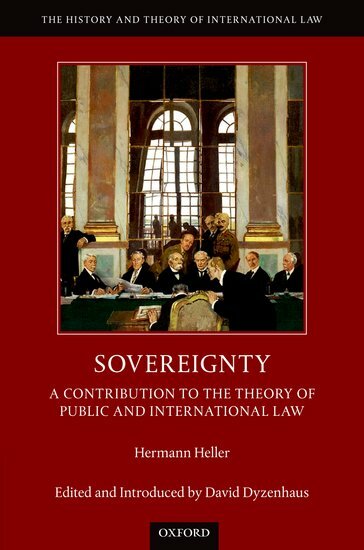 Sovereignty is the major work that Heller himself brought to completion. Heller was one of the leading public lawyers and legal and political theorists of the Weimar era, whose main interlocutors were two of the giants of twentieth century legal and political thought, Hans Kelsen and Carl Schmitt. In this work, he addresses the paradox of sovereignty. That is, how the sovereign can be both the highest authority and subject to law. Unlike Kelsen and Schmitt, who seek to dissolve the paradox, Heller sees that the tensions the paradox highlights are an essential part of a society ruled by law. Sovereignty, in the sense of national and popular sovereignty, is often perceived today as being under threat, as power devolves from nation states to international bodies, and important decisions seem increasingly made by elite-dominated institutions. Heller wrote Sovereignty in 1927 amidst the very similar tensions of the Weimar Republic. In an exploration of history, constitutional and political theory, and international law, he speaks clearly to our contemporary concerns, and shows that democrats must defend a legal idea of sovereignty suitable for a pluralistic world. Please RSVP here. This event will take place at the Guarini Institute for Global Legal Studies, 22 Washington Square North. Refreshments will be served.